Last week we had a showcase of Italian web design from a member of the Italian web design community. This week we have a showcase from a different perspective. This week, we have a showcase and look at Italian web design from a designer outside of that community. Complete with interviews and more, this second installment will hopefully paint a fuller picture of the state of the web design industry in Italy. The Italians are remembered for producing an ongoing stream of gigantic and awe-inspiring artworks, largely based on the intellectual climate or religious trends of their times. Frescoes and mosaics have been a staple in Italy, from the medieval period onward. Byzantine art was largely decorative, colorful and calligraphic. Naturalistic art was next, created by the groundbreaking Giotto de Bondone. Gothic art emerged at the same time, also called the International style. Patrons emerged from rich and powerful clans in the 1420’s, and remained influential for half a millenium. This was the time of Donatello, Brunelleschi, and Alberti, who looked back on the classical period for inspiration. Tuscan painters Fra Angelico and Fra Filippo Lippi experimented with color during the same era. Lyrical artists, such as Botticelli, Filippino Lippi, and Baldovinetti emerged next, paving the way for the Big Three: Michelangelo, Leonardo da Vinci, and Raphael. These great masters were rivals for ascendancy during the Renaissance—Raphael with his religious paintings featuring Madonnas, Leonardo with his wildly imaginative notebooks and Michelangelo with his Sistine Chapel. Mannerism followed in the early 1500’s. Titian was the foremost master of Venetian painting, characterized by luxurious color, sensual bodies and exquisitely lit paintings of scenery. By the 1600’s, Rome was the epicenter of a new style, Baroque art—church ceilings decorated with clouds and cherubs. The energy and joy of all things Baroque was best captured by Bernini. In the next century, the Venetians again ascended with the rococo style, distinguished by its immense landscapes. Italy’s impressionists pre-dated all others. Their expression of this movement was through light and shadow (macchie). More giants emerged with the two schools of Post-Impressionism. Those who meticulously depicted strict structure were Cezanne and Seurat. Those who experimented with color and shape were Gauguin and Van Gogh. Its name (Neoclassicism) explains Italian art’s swing backward once again into the design aesthetic of Ancient Rome and Greece. Artists Leon Battisa Alberti and Filippo Brunelleschi utilized the elements of mathematical symmetry and geometric proportion. As the 20th century dawned, Modigliani became the acknowledged master of Expressionism, followed by Cubism and Futurism. Girogo de Chirico edged the Metaphysical movement toward Surrealism. Italians express themselves aesthetically with the inborn fluency that other humans use to breathe. Therefore, Italian graphic design displays an expected strength and freedom of expression, while maintaining a surprising softness and informality in its design elements. Italian design schools include the study of art history and public spaces in their web design curriculum. Basic art principles are used as a grounding, such as color theory, expression of geometric shapes (especially the square) and optical illusions. Modern technical skills are combined with humanism, so that practicality and user interfaces are uppermost. Italian web design maintains an intimate connection between the creator and the observer. What’s Unique About Italian Web Design? • They use a usability rule called “Tired Rule”, which outlines a specific set of usability guidelines to follow. • The websites often enough require to be published in two languages (Italian/English). 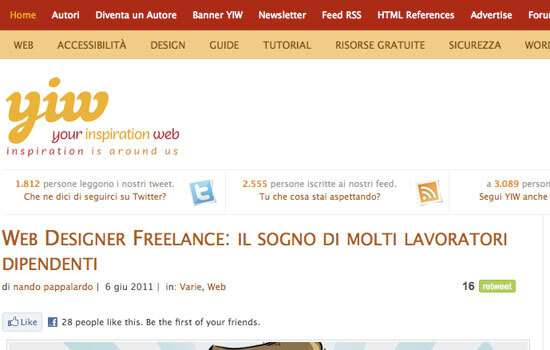 • Italian web designer earn less than british or american designers. • They have a particular taste for retro style in typography,they use and mix fonts to obtain a perfect geometry and an perfect readability for their design. • They are extremely precise and take care of the details, by doing so, the website will be noticed for sure. • There are features in common to almost all the Italian sites. • Many designers are still using Flash, So there are alot of sites created by Flash. We talked to people in the Web design industry in Italy to get their opinions on the state of affairs. Q: Could you please describe the life of a freelancer, developer and designer in your country? (Your Inspiration Web Staff): Working as a webdesigner – especially as a freelancer – can be very stimulating and quite demanding: looking for inspiration, working on the design and development phase, studying and honing one’s professional skills, etc…In terms of one’s personal life, working hours don’t exist, daily schedules don’t exist. One can be sleeping during the day and working at night, or having to work for ten consecutive projects without having any inspiration whatsoever…this is a struggle that every freelancer, developer and designer must confront on a daily basis. (Piervincenzo Madeo – PV. M Garage): I’m taking my initial steps into this world. I have a ‘strange’ background story, because I come from engineering studies and for this reason I don’t have a complete view of a real life as a freelancer. But I can say that to start my activities, in order to engage clients and to create a strong network, I had to take a look beyond the italian borders… I have to write a blog in english to have visibility, and I have many requests from clients who live in other countries. I love Italy, but it’s hard to begin a professional activity in web design field building (basing) a business only on italian audience. (Raffaele Rasini – Creative Bits): Difficult, almost all web designers start out as a freelancer but without an entrepreneurial spirit and desire to get involved in a sector where there is plenty of competition after the first year many decide to go to work in a web agency or even change job direction to something more classic and recognized. We must hold on, collaborate with other web designers and choose carefully (when possible) the works that are proposed in accordance with the potential advertising that could generate more than the earning after work. (Egidio Bacigalupi – Beaver Lab): Life is hard … especially to get it started! We work at any time and the idea of the weekend and spare time disappears. We must be available and open with our client: the satisfaction is crucial because the word of mouth is still the best market strategy. Our daily diet is based on many coffees and we must never lose the desire to take the risk and to be as much creative as possible! (Michela Chiucini – web is love): The life of a freelancer has some pros and cons. Sometime we have to work more time than employees but we also have the freedom to manage our working hours and projects; the most annoying aspect is the paperwork, I hate it. (Your Inspiration Web Staff): I believe inspiration is a universal thing, just as its sources tend to be. It’s true that we look at CSS galleries once in a while (as well as blogs which focus on web design) looking for ideas, but most of the times I’ve noticed that inspiration comes in the form of flyers, tv ads, photos, colors, fonts, wallpaintings…a little bit everywhere, and rightfully so. (Piervincenzo Madeo – PV. M Garage): Usually on-line, from css galleries and works of top-designers all around the Web; sometimes also off-line from magazines, newspapers, from TV too. But being active in the design community is my biggest source of inspiration: great people, stunning works and helpful ‘colleagues’. (Raffaele Rasini – Creative Bits): Many say that to find inspiration one must observe nature, go for a walk and take photos, get off the computer and look for creative input elsewhere, I find this good and necessary, but I also think that since we are ux designers and not painters we also need to consider the various web resources like patterntap.com or the wonderful drawar.com that allow us to follow, analyze and replicate the solutions to common problems without having to reinvent the wheel each time. (Egidio Bacigalupi – Beaver Lab): Internet is the best source… but often the best ideas rise up during a trip by car or chatting with friends over a plate of pasta. (Michela Chiucini – web is love): Inspiration comes when you look at something familiar with different eyes. There isn’t a particular source where I get inspiration, it could happen reading a book, watching a movie, travelling, walking or just sitting in front of my computer. Rather, the most prolific moments are late afternoon and early morning. Q: How do Italian designers handle typography? Are any font embedding techniques widely used? Is the choice of available fonts big? How vivid is in your opinion typography in Italian web design? (Your Inspiration Web Staff): Of course, Italian designers are no exception, they know that good-looking typography can determine whether a website or design will be successful or not. We use some of the most common techniques, such as @rules “@font-face”, which are provided by CSS (currently supported by all major browsers), cufon, sifr… basically all of the main techniques present in this sector. (Piervincenzo Madeo – PV. M Garage): If I think about pro-designers, really pro, I have to say that they work superbly with typography. They have a particular taste for retro style in typography and I love how they use and mix fonts to obtain a perfect geometry and an perfect readability for their design. It’s just my opinion from my experience, but I don’t think there is a large use of embedding techniques, but who looks for a wide choice of fonts, for web design works, they use @font-face. It works quickly and without adding problems to the development routine. (Raffaele Rasini – Creative Bits): The web panorama in Italy is not so advanced as one might think, with regards to typography we can not compete with the quality of other countries, as I said before there are too many beginners who decide overnight to be a web designer without any graphic background, without having studied the essential bases of typography that are necessary to achieve at least a decent website, this does nothing but increase the mediocrity (at least from a designer prospective) of italian websites. Fortunately there are also real professionals that they do their job well and bring a breath of fresh air in an otherwise depressing web reality. (Egidio Bacigalupi – Beaver Lab): I love typography (I also deal with graphics and printing). I think fonts give you great potential for communication and have an intrinsic beauty. There are many beautiful fonts but also creating your own is fascinating. In the last period we are developing projects through the interaction and composition of fonts and the use of kinetic typography. (Michela Chiucini – web is love): In Italy many designers are still using Flash, this has been the widely used solution for a long time. In html based websites the choice is the same as for other countries. Luckily more and more clients are asking for html websites so the attention on typography is increasing. Q: What’s the situation on the market? How much do designers earn? (Your Inspiration Web Staff): The Italian market is still quite young in regards to web design. The term ‘webdesigner’ is used very loosely, and one can be labeled as such even without having the necessary experience. Often enough, clients have a hard time distinguishing between a great-looking design and website with one that is mediocre and amateurish: they still think that what’s important is to be on the web, without considering the how. Because of this it’s quite hard to find clients who are willing to invest adequately on creating a website, considering that there are providers who charge ridiculous prices, such as 100 euros. Having said this, a webdesigner’s potential earnings is based on his or her level of preparation: some webdesigners succeed and are able to make a living with this while others might pick up webdesign to make some money on the side. (Piervincenzo Madeo – PV. M Garage): There is thing that I can affirm without fear to mistake: ‘italian web designer earn less than british or american designers.’ Here, I’m talking only about italian scene, the culture of web lacks. We have to educate a client before asking for a payment, because many italian clients think a website can be done in one day expending 100 Euros. (Raffaele Rasini – Creative Bits): There is high demand but few realize how much work there is behind a website and expect the prices of a flea market, I think the average earnings of an Italian web designer are at least 1/3 of, at the same level of capacity, what an American earn. (Egidio Bacigalupi – Beaver Lab): The market is saturated, the communication culture doesn’t exist in many companies and it is not so easy to get paid … you need to propose yourself in a new and fresh way to be convincing and be economically competitive! I also believe there are profound differences between north and south: the north is certainly more receptive and willing to invest in the communication field. (Michela Chiucini – web is love): Many clients are just discovering the importance of having a well crafted website and this is a good thing, but it’s still an underpaid job if compared with other countries. (Your Inspiration Web Staff): Not exactly, a lot of people are still confused about what a web designer really does and many believe (frustratingly, I must add) that web design is not really a profession but a hobby, something that is easy to do. Only few people really understand the passion, the sacrifice and the years of study that are needed to be in this line of work, so that these people also understand the true value of webdesign: economic as well as mental. Hopefully things will get better, I really hope so. (Piervincenzo Madeo – PV. M Garage): As I said here the culture of web is lacking. For this reasons there are many people who think that with a CMS installation nothing is impossible. After some days and a lot of failed attempts the looking for a professional web designer begins. So, those who know the issues and the hard work that there is behind a well-done website deeply respect our work, other people tend to think of web designing and developing as a low-tech job. (Raffaele Rasini – Creative Bits): Unfortunately not, many see us as computer experts who also make web sites. Actually it is not so, it is a serious and very important job, the figure of a ux/web designer is essential and irreplaceable, their work can literally determine the success or failure of a web service, regardless of the efforts of a marketing department, if made in the wrong way. (Egidio Bacigalupi – Beaver Lab): It’s a work of precision as for printing. We have to be extremely precise and take care of the details: by doing so, the website will be noticed for sure … But unlike print, you can correct mistakes or change something in the works without compromising it. From my colleagues’ perspectives this is definitely a high-level and high-precision work, while it’s different with clients: they often make everything easy and give little value to our work. (Michela Chiucini – web is love): It strongly depends on the culture the person has about the web. Those who have got enough knowledge of web issues, of course, appreciate our job. We could say that to learn web design is as simple as to learn to do it badly, that’s why some people think it possible to be able to craft a website in few hours with little effort; clearly these people are the first not to consider web design sophisticated work. Q: Do you see any remarkable differences between Italian designs and ones in the US and Western Europe? (Your Inspiration Web Staff): Honestly, I can’t think of anything. I feel that web design is not a sector in which one can find differences resulting from different countries, on the contrary: a sense of aesthetics, development, programming language…all of this is considered universal, bringing web designers closer to one another, something which I don’t think can happen in other professions. We are all part of the same club. (Piervincenzo Madeo – PV. M Garage): As I said here, in Italy, the ‘ignorance’ about this field is widespread. This creates some problems when we must explain to our client why we want to earn 20 euro/hour, 15 euro/hour or 30. So, there are people who to earn their ‘salary’, they push down the manometer of ‘quality’ and pump the ‘quantity,’ for this reason many italian web designs have an ‘ordinary’ quality (minimum for decency). However there are great designers, I’m thinking of Michela Chiucini , Simone Maranzana , Francesco Mugnai who work and create great designs following recent world wide trends designing their website. (Raffaele Rasini – Creative Bits): Abroad have more courage in breaking the rules and trying something completely different from the rest, in Italy there is much distrust for everything that is new and it always ends up starting to use a model already tested with little creative freedom. (Egidio Bacigalupi – Beaver Lab): I think they are a step ahead and more innovative. They set the rules and trends of the moment…and they like to be different and dare! (Michela Chiucini – web is love): I see remarkable differences between good designs and bad ones. Nowadays we see good designs from every country. The web is a global medium and every person follows his own taste and cultural background. Q: And how does all of this work? Is the situation currently good or difficult? Do most customers want to have an English-speaking or Italian-speaking sites? (Your Inspiration Web Staff): I can say that the situation is improving, businesses have started to understand the potential of the web and of its economic benefits. This is why they are willing to invest online more and more. The first businesses to adopt and take advantage of the web were tourist-related enterprises such as hotels, restaurants, and bed&breakfasts which often enough require a website to be published in two languages (Italian/English), since they must be found easily. (Piervincenzo Madeo – PV. M Garage): In general, the situation we have here can only improve. But I think we are turning the right way. English-speaking or Italian-speaking, you said… depends on the client’s target and what kind of website they need. (Raffaele Rasini – Creative Bits): There are ups and downs as in the other countries, the economy is recovering and the urge is coming back to get back into play with new projects but the time has lengthened, all is progressing slowly and there is still much uncertainty. I am still positive that within 2 years everything will be back to normal as before the crisis. Surely one of the main factors that have most impacted the Italian economy is the decline in exports to other countries so it is now almost obligatory to have a web site in English, even more than other languages like French and Spanish. (Egidio Bacigalupi – Beaver Lab): The situation is often difficult because to set in projects poorly designed is always more and more complicated. All customers want a multilingual website but they often don’t provide the contents in the main language. Luckily, some recent experiences gave me hope: companies are starting to understand the true potential of a website well structured and rich in content, and they want to invest time and money. (Michela Chiucini – web is love): The general situation could be definitely improved for the reasons mentioned above. Italian, English (or both) strongly depends on what kind of website customers want and on the market they are turning to. Anyway, even if not strictly required, an english version helps increasing the traffic and makes a website look more professional. Otba Mushaweh is Logo Design Specialist and blogger, He is the Founder and editor-in-chief of Logo Talks which is a platform and resource for designers, students and everyone who interested in all about logo design, brands and typography. He is also freelances under his business Logos Guide Studio. I think that the correct title for this post was Italian Digital Visual Design. As I wrote in the comment for the previous post, web design is a different thing. Sorry you disagree with the authors presentations. Perhaps you would like to offer us a real look into the Italian web design world, since you say these interviews and showcases don’t seem representative enough for you? Interesting list, I liked the visual impact of many sites proposed (but for the same reason I must agree with S. Dominici). Maybe it’s just me, but I’m still missing the reason why some sites have been included… are some of them an example of how websites looked in 1999? I’m referring to Gruppo AFV Beltrame, Minacciolo, Global Shipping, di Gregotti among others. Other sites lack of originality – I’m thinking to some sites that look like standard wordpress+free template (I don’t want to be offensive, I’m just saying what I thought when I saw them) like La Botteghina, Francesco Gavello. Finally some sites look really different or does not exist anymore: Francesco Agnoletto, Casa del Bimbo – they moved one year ago, Pedane Vibranti refers to another site. What really disappoint me is that too many of the mentioned websites have been developed by the same company, and that many developers/companies are localized in a small part of Italy (they’re all in a 100km radius from Venice). Do they completely represent Italy or is the showcase offered a little biased? Those sites were included because the author compiled them based on what he felt needed to be included to round out the showcase I would imagine. There are enough sites featured that any cuts could have been easily made, but Otba chose to feature them, and alas, we left them in as well. Given the apparent state of the industry there (according to the interviews from both posts) you have many clients there (like here and probably elsewhere) that undervalue the work, and as a result the landscape is not all perfection. I think the showcase is representative of this fact. And given that the showcase is called Showcase of Italian Web Design, and is not titled Showcase of Exceptional Italian Web Design, I think there is room for everything. Wouldn’t be much a look at the scene if only the best of the absolute best was being featured, would it? Not sure if the showcase is biased or not? Unfortunately, only the author could truly answer that. However, given that in the course of both posts, nearly two hundred websites were offered without repeating each other, I am not sure I see any sort of malicious patterns forming on the part of the two separate authors working independently of one another. It seems to just be the way the cookie crumbled. :( Sorry to disappoint. WOW! I’m Italian and I’m happy to see a collection of italian web sites! Thanks for sharing your design, and leaving your thoughts behind. Hello, i’m Francesco Agnoletto and i’m honored by your mention! these italian designs are really good. thanks for sharing with us. Hi, thank you for your mention. We changed the graphics of our blog (that now is also in english! ), can you replace the screenshot please? Image replaced! ;) Thanks for the heads up. Btw, i’m not really agree with the selection of the sites in this showcase. In my country there are a lot of good web designers, and i found a lot of great italian websites, much better of the sites features in this article. @Furins As far as your comment about “La Botteghina”, I would like to clarify that it was a completely handmade design for an italian artisan. No free theme but just custom design & development to meet client’s taste and needs [http://flic.kr/p/4CuqVH]. Our websites are always designed from scratch, even if they’re built on WordPress (I admit, we’re wp lovers). I have to agree with some of the comments above. Most of these websites look incredibly dated. For example this site: http://www.beltrame.it/ looks like something from the late 90’s with the customary cheesy flash ‘splash’ screen and its table based build. Very poor, I would have thought you guys a Noupe would have checked the quality of the sites before posting up this article. Maybe my website would have been nice here.